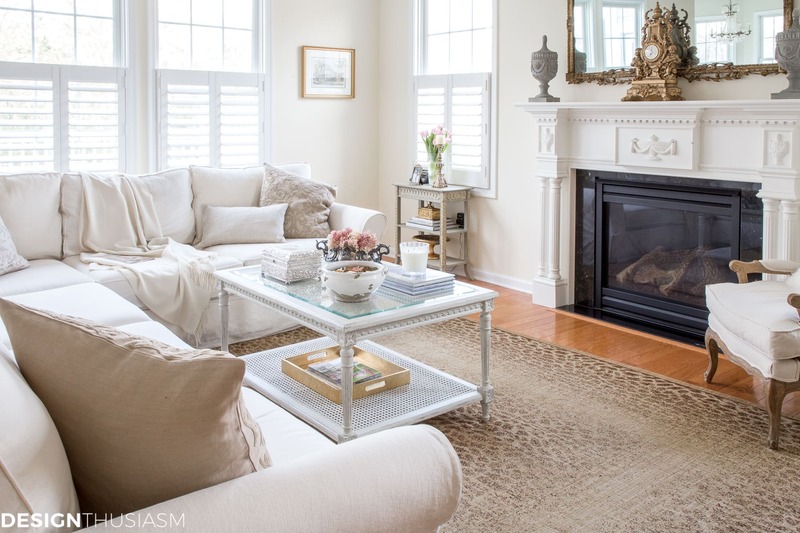 In this post: The family room needs to serve several purposes from functional to beautiful. 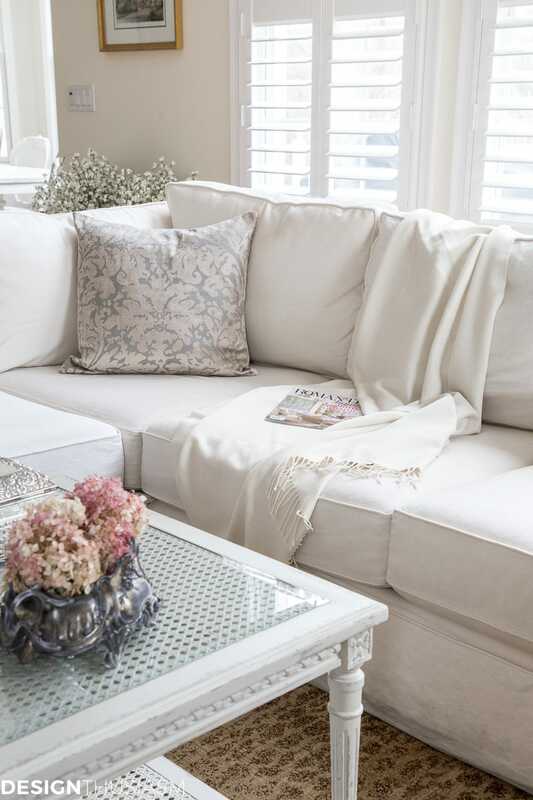 These simple changes will help you decorate with casual elegance. 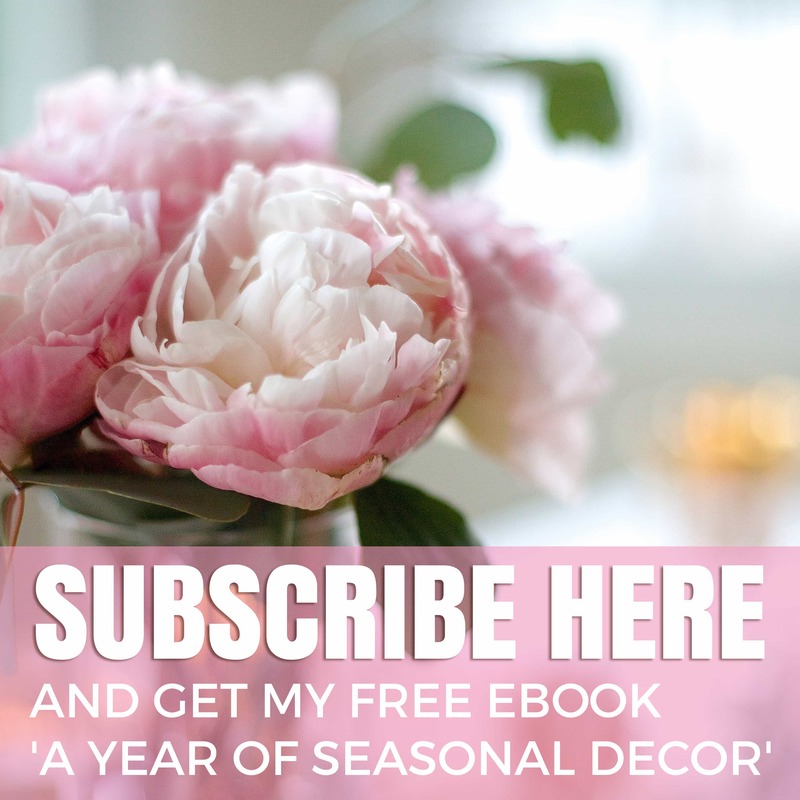 The first go round was two years ago, when we moved into our new home and I got down the basics of how I wanted to decorate. I solved the key issues of furniture placement and how I wanted each room to function, as well as setting the general tone of design style. 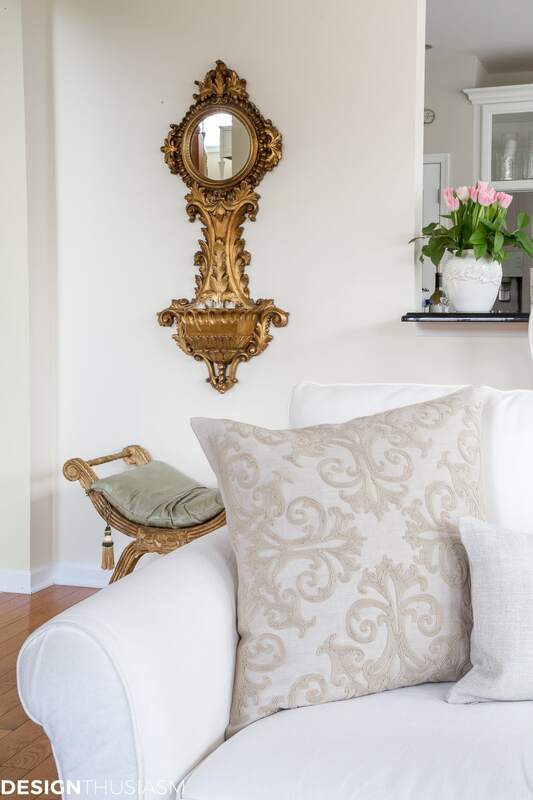 In the interim, we tackled some larger renovations like the kitchen makeover and butler’s pantry, but as time passed and those projects got completed, I started to look at my living areas and knew they were ready for some refinement. As we got acquainted with the house, my design vision crystalized and I’ve been itching to start fine tuning. Last year I started with some updates to the dining room, but the family room still eluded me. I’ve been wanting to get it right for a while now and I think I’m finally close. The best part is, all it took was a few simple changes to make all the difference in the world. Inevitably there will be those that like the old way better. I can live with that. But I have to be true to my own taste. For the most part, I was happy with the key pieces of furniture in the room. 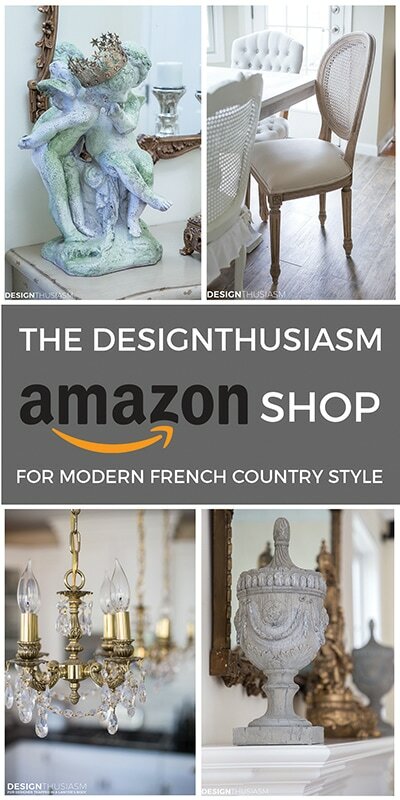 We replaced the coffee table last year which made a huge difference in adding French character to the space. But I was still struggling with the overall look. Something was off. I’ve always known the room would be much prettier if I had two sofas or a couch and some scattered chairs. But we use this room daily and we really love having the huge sectional, despite the fact that it dominates the space. We enjoy nestling into its corners and we’re unwilling to change it out. So I had to look at it with fresh eyes. 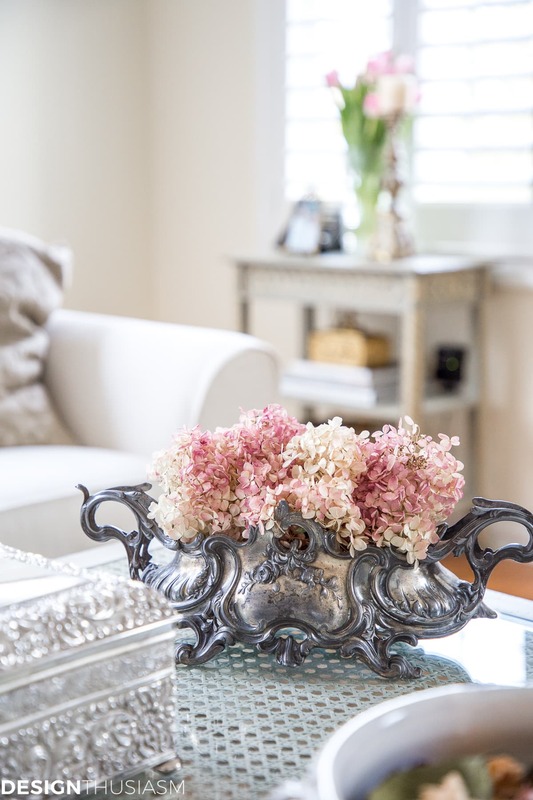 The best way to do that, and something I highly recommend to anyone restyling a space, is to move all the decorative items out and to look at what’s left as if approaching it for the first time. That means every pillow, every vase, every tchotchke. I cleared off the coffee table, mantel, sideboard and sofa, and moved the pieces that were standing on the floor, as well. 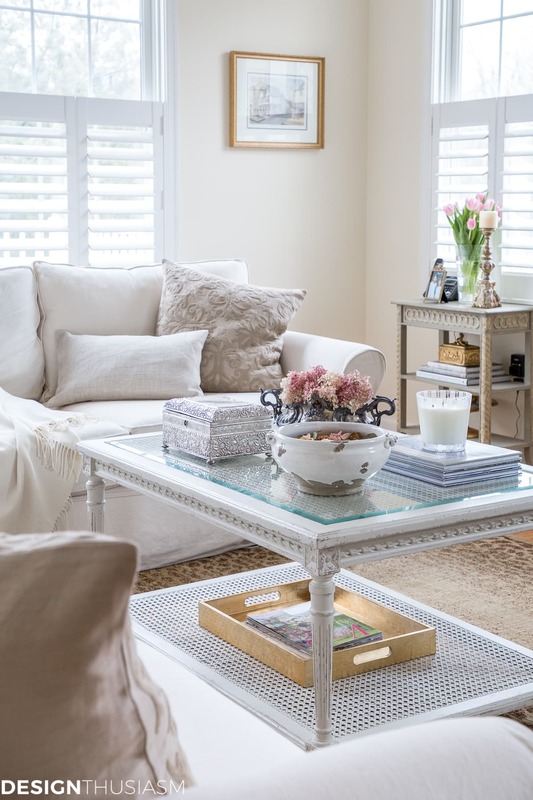 And lo and behold, the first thing I noticed is that I loved the clean look of barely there neutrals and wanted to maintain that clean, calm spirit. I also knew there was something holding me back from attaining that look. My beautiful chinoiserie vases that have been on my mantel since I got it were pulling the room in a separate direction. I love them. I’m going to keep them. But they had to go from this space, because they were saying one thing, while the rest of the room was saying something else. 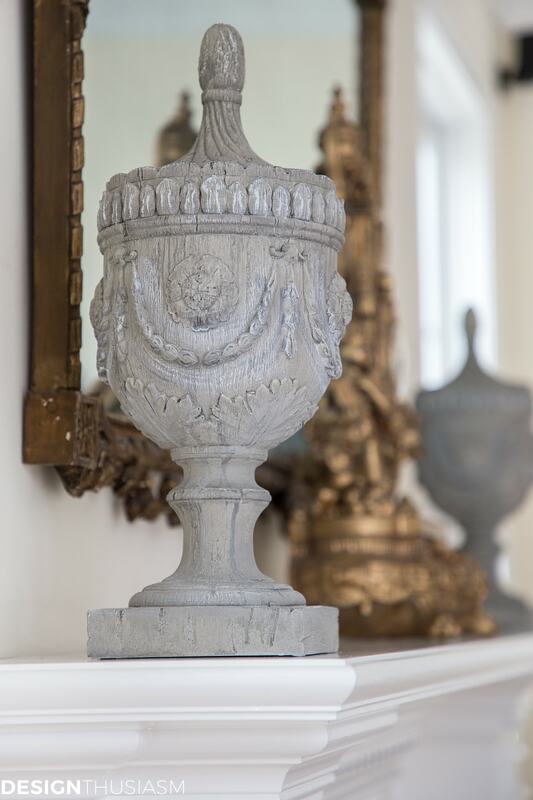 My mantel needed patina and these distressed finial urns satisfied that need. With that out of the way, the next area to tackle was the sofa. 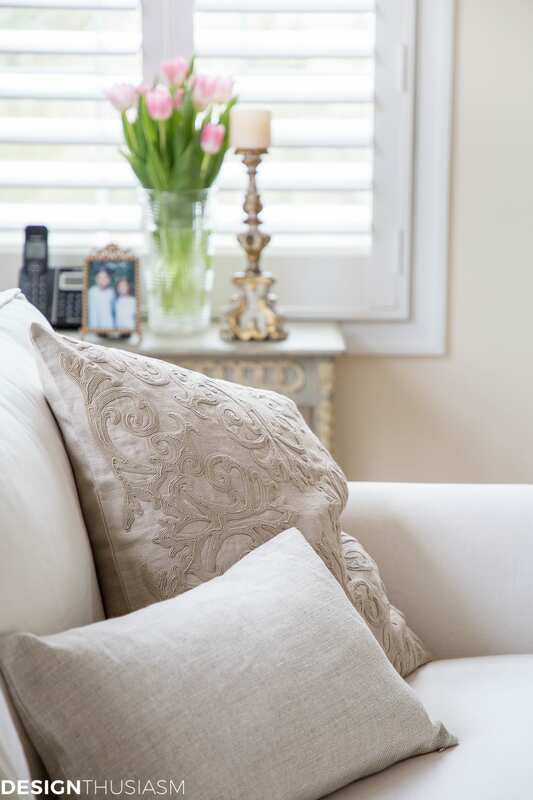 I wanted a washed linen attitude with soft neutral colors and I began scouring the market for pillows. I settled on a selection of mostly linen pillows, including the soutache scroll, above, and a cross weave linen lumbar. In the corner, for interest, I added a printed velvet damask and I’ve got two more pillows on the way with pom pom tassel corners. 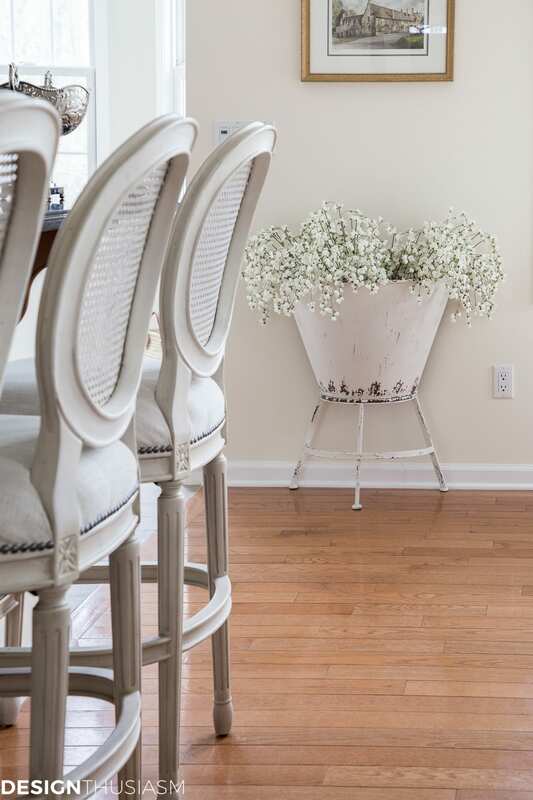 I’ve noted in my kitchen, that I love working with shades of white, as it makes it really easy to change the mood of the space with pops of color. The blue and white vases made that difficult, as did the floral pillows I had before. Now everything harmonizes and can easily be moved in a new direction. I enjoy updating seasonally as this near blank canvas opens the door for different looks. Here, I’m playing with pinks, simply by adding spring flowers, but I can just as easily move in any number of directions as the spirit strikes me. The coffee table vignette was also bugging me, although this version uses many of the same elements. The segmenting in quadrants feels neater to me and I wanted mostly things that serve a purpose. The silver box holds the TV remotes and the candle and potpourri are for fragrance. The photo books are popular with guests (they’re of my travels) and that just leaves the dried flowers as purely decorative. I’m still not sure it’s 100% there, but it feels closer to an intentional display. I promised a reader a few weeks ago that I’d be sure to show my TV in an upcoming post. It sits over a console table we drilled holes in for the components and you can see the speakers in the corners of the room, as well. The sound in here is amazing and watching a movie rivals watching it in a theatre. I keep very low decorative items on the console to avoid blocking the screen. 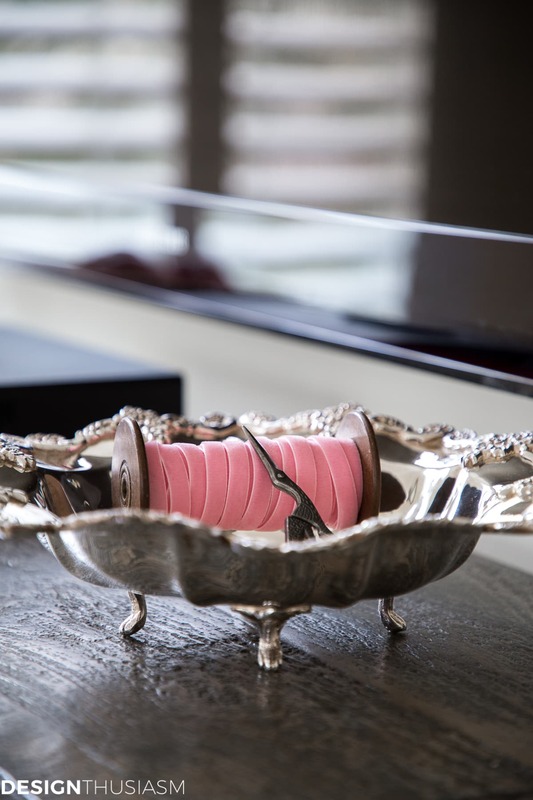 The vintage ribbon here and antique scissors add charm to the silver bowl. I also re-styled my planter stand which has never really been filled appropriately for the room. The draped white flowers full the tub well and are more in line with my creamy white palette. The tiny Swedish table in the corner was another area starting to get overrun with tchochkes, so I cleaned that up a bit, as well. It’s a good spot for fresh flowers in the taller vase, as I wanted to keep the coffee table vignette nice and low. This view of the mantel well defines my vision, mixing gilding and patina in neutral shades to bring casual and elegance together. 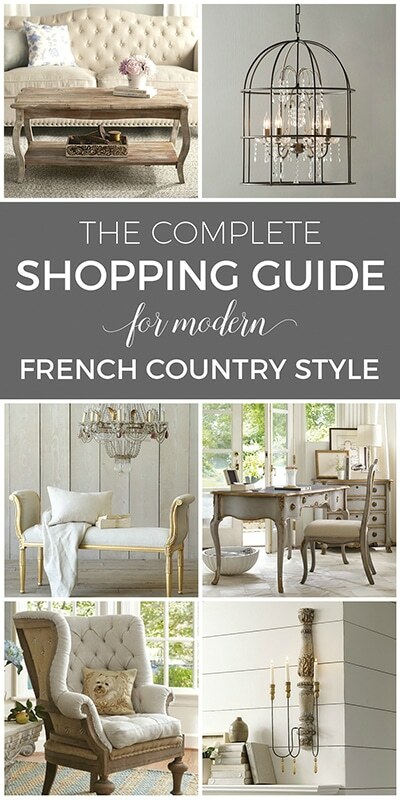 One simple white fur pillow on the French chair is all it needs to finish off the picture. But there’s still one thing I’m aching to change and I won’t feel done until I do. I’m ready to let go of the pale yellow walls and bring in my favorite Tapestry Beige. But we just painted 2 years ago so I’m not sure hubby is ready to justify the expense. One day I’m just going to grab the bucket and get to work myself. But then I look at the huge fragile mirror and think twice about DIY-ing the job. Still… to be sure, they will soon be tapestry beige walls! 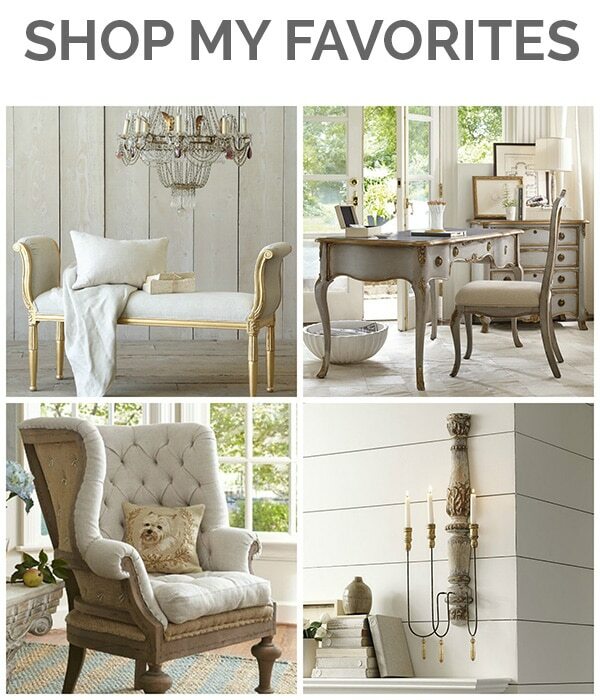 Family Room Source List – Click on the items below for direct links to the products. Where actual items were no longer available, I’ve provided similar options. So pretty Lory. Casual and comfortable. I love all the changes! So beautiful! I think it looks great! Love neutrals for all the same reasons. I know you’ll love it when your walls are painted. I tried a pale yellow many years ago. That little crush lasted about 6 months. I feel ya! Oh yes, I cannot wait! Honestly, the hallway is worse than the family room, because it’s a deeper shade. it. must. go. Love the changes! So fun! I think it is beautiful. It is amazing to me though, with just those few changes in color, the walls don’t seem as yellow.They took on a completely different look with the blues. I really thought you had painted them the TB. I think I’d live with it for awhile. I love it. I also checked on that beautiful rug and it is sold out :>( It looks wonderful with the sofa and floors. Your style is beautiful as always ! It looks even more amazing. I love all the changes. You absolutely must paint those walls now. It will be quite a transformation. Like Kathy, I checked on your rug but it’s sold out. I think I would like a size bigger, in any case. I really think it would elevate the elegance level in my great room so I’ll be keeping an eye out. Thanks, Joanna! Yeah, I’m pretty convinced about the paint. It will likely have to wait until after the master bath renovation, because I don’t want anything to prevent that from happening… 😉 But soon! Re the rug, I will keep an eye out for it elsewhere and provide the link if I find it. I know I’ve seen it in several places. I have a master bath renovation coming up myself. Saving my pennies first to get what I desire not what I can afford. I’ll watching for your pics to come. I may steal some of your ideas. ? Thank you for the promised TV! 😀 It shows it really is a beautiful, functional, FAMILY space that people live in–not just a pretty room to look at. 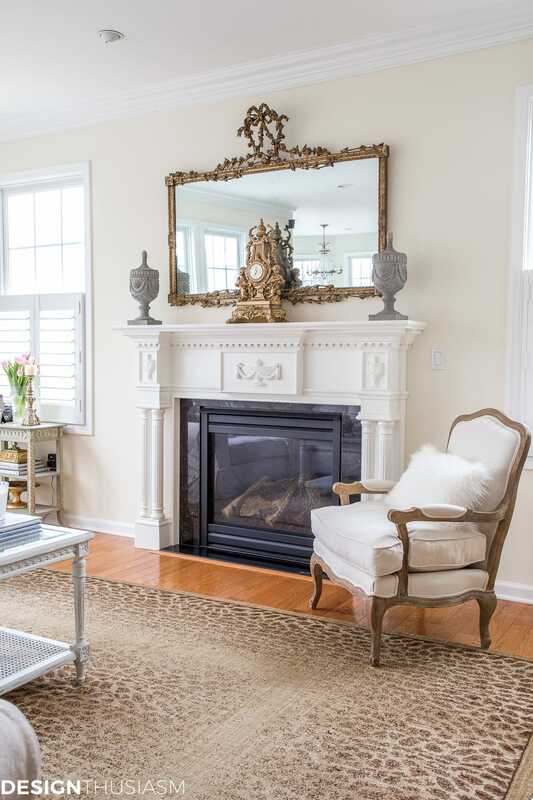 I love that you chose to highlight that gorgeous fireplace with an equally gorgeous mirror and mantle clock, and situate the TV somewhere else in the room. I know it can be challenging to arrange seating that accommodates that, but who wants to stare up at a TV for the length of a movie, or have it the focal point of their space? The renewed decor is lovely. I have a preschooler and a toddler, so I’m still a few years away from having pretty decorative objects on low tables (omg, scissors at kid height!?! 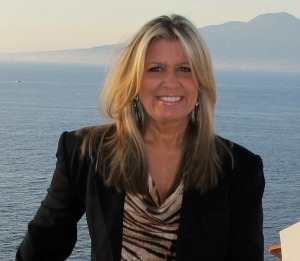 ), so seeing your rooms is like taking a wonderful adult vacation! And, yes, I too had little ones at one point, so I know what you mean about needing to be careful. That’s not an issue for us now, but the scissor is up on the console table, not on the coffee table, if that makes any difference. Great changes! Just a thought but since you’re paring down, I kinda see a fig bush or something of that sort where the Swedish table is now. It just seems like some “statement” greenery would bring in another level of texture. ??? Lory, I had to chuckle reading your post as I, too, had exactly the same dilemma! Like you, I love both the country and formal English and French styles, and found myself going too far formal in the family room. It’s difficult with these open floor plans to stay elegant and cohesive, yet not too over the top one way or the other. As far as your sectional goes: there should be spaces in our homes that fulfill our need for comfort–that is what our homes are for. Your sectional is lovely and certainly fits in with the style you are going for. Enjoy it! I’m coming for that gorgeous candlestick LOL! Please disclose where you found it. Can you believe we are having all these warm temps in Feb.? The Bradford pear trees are already getting their buds. Hugs! There’s so many things to love about this room, I don’t know where to begin. You’ve done a marvelous job! That gorgeous box for hiding the remotes is brilliant! Love the little scissors. I’ve always been fascinated by scissors, in general. The only thing I would change, and I realize it’s a quirk of mine, is that I wouldn’t have potpourri in the house at all. Potpourri is made up of decaying living things, like herbs, flowers, fruit, etc. It has never felt like good feng shui for the house; plus it’s a pain to keep the dust out of it. I use beautifully scented infusers and candles throughout the house instead. I, too, am eager to paint my walls in a neutral, perhaps soon. Thank you for inviting us into your lovely home. Thank you, Maria! Interesting attitude about potpourri. But really, one can say the same about all wood furniture then. I guess you’re not into dried flowers… 😉 I think of it as extending their life, rather than decay. I know, it’s totally illogical. My friends have pointed out the same thing. As I said, it’s just one of my quirks. But truthfully, what I saw first in your room was the overall feel of openness and comfort, with some classy elements thrown in. I loved it. What an excellent idea to clear out the entire room excepting the big furniture pieces and then you can get a vision of the room as you would like it. Phew! How’s that for a run on sentence? Lol I’ve been struggling with my family room, as well. It’s not that I don’t like it, as is, but I need a change. Your room looks lovely in mostly whites. I love the finials on on your mantel and the simplicity of just the two of them a great clock. I’ve pinned your coffee table styling for reference. I agree on keeping the sectional. We want pretty in our family room while not giving up comfort. I love it! 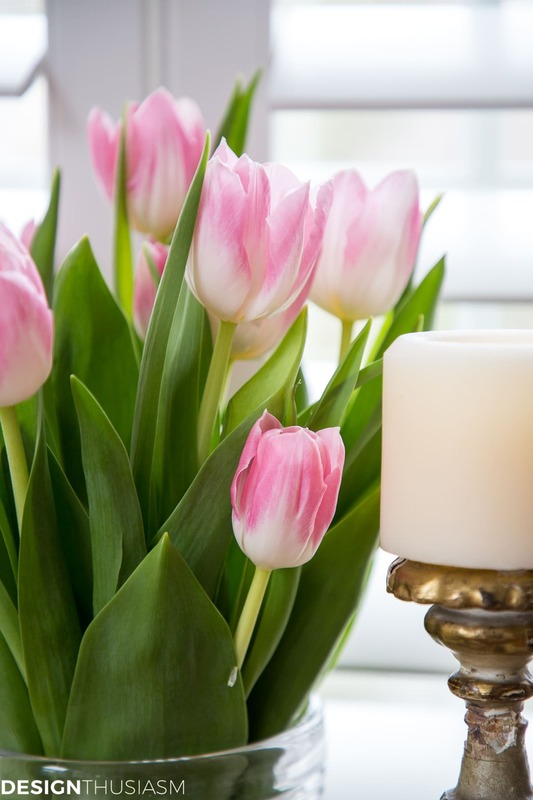 I love your house and enjoy these updates you are making to bring everything into your style and taste. I have to admit, now that you’ve moved them, the blue and white vases, although beautiful, always seemed wrong in this room. I like the urns fit with the neutral palette and the French flavor much better. I enjoyed looking at the photographs–you have created a beautiful space. I am curious about the absence of any lamps–do you use a ceiling fixture, or did you remove some of them for the shoots? Thanks. Thank you for the kind words!! We do have overhead lighting, which I love for functionality, but I enjoy the look of lamps and chandeliers, too. I add them in most of my rooms, but in the family room, the sofa is so dominant that there really is no space. 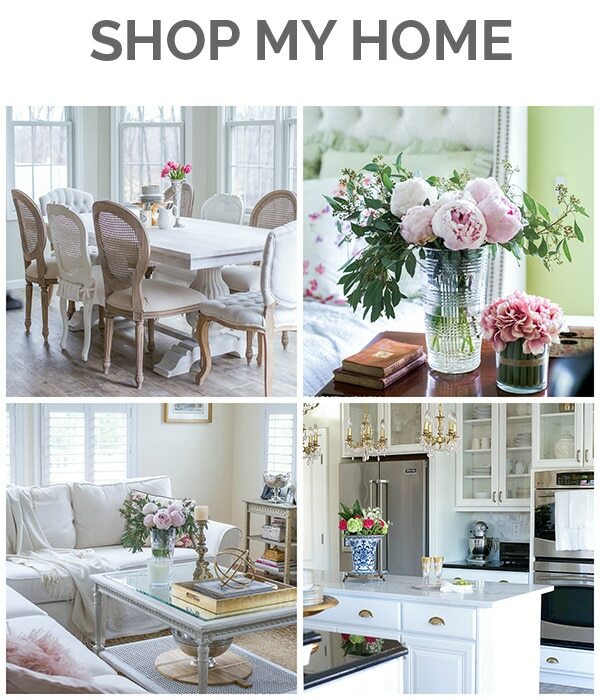 Lory, I love your French Country style, which I love, and have been following your blog for years. 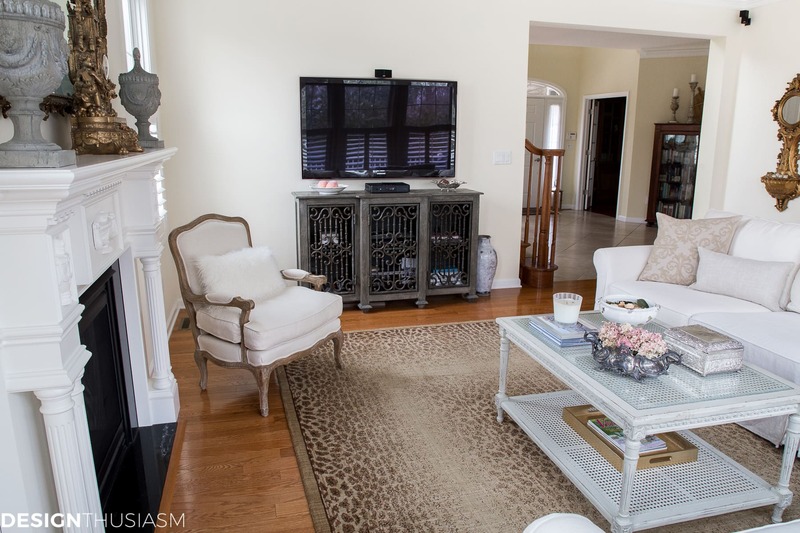 In your redesigned family room, I have one question? With the TV at the far end and the sofa facing the fireplace, the French chair next to the fireplace, how are you able to comfortably watch the TV?